This week’s Netflix film is a detective noir film that is quickly becoming a cult classic. The film Brick, written and directed by the mind behind Looper Rian Johnson, is a modern day detective story following the structure and theme of classic film and literature. The film’s principle mystery is a murder but what is unique about it is it takes the classic detective film and puts it into High School. I’m going to try and simplify the fairly complicated plot into only a few paragraphs. In this story, our loner detective is student Brendan Frye (Joseph Gordon Levitt). 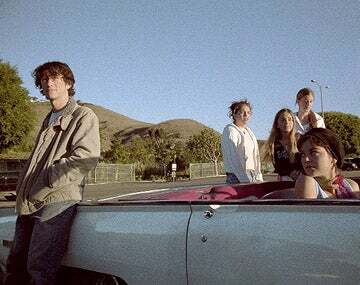 Brendan is a sad and lonely young man after being dumped by his girlfriend Emily Kostich (Emilie de Ravin) and turning his friend into the authorities. After receiving a mysterious, panicked call from Emily asking for help, Brendan uses the leader of her group of stoner friends Dode (Noah Segan) to get in contact with her. Denying everything she said on the phone, Brendan steals her notebook. Following an odd symbol in it, Brendan finds Emily’s dead body and takes it upon himself to solve her murder. Brendan’s search puts him directly in the middle of a drug war. After hearing Emily say “the Pin” on the phone, Brendan figures out that the Pin is in fact a person. Brendan meets with the Pin, a drug dealer, to try and figure out why Emily was murdered. While it takes him a while to uncover anything of consequence, Brendan eventually learns that Emily’s death may have had to do with a shipment of heroin bricks, a shipment in which one brick was missing. As Brendan continues to pry he meets Laura (Nora Zehetner), a woman who at first seems innocent, and Tugger (Noah Floeiss), the Pin’s violent and angry muscle. Working himself to the bone, Brian stops sleeping and puts himself in harms way to solve the murder. As a drug war blossoms around him, Brendan needs to determine who he trusts, avoid having Emily’s murder pinned on him and stay away from an increasing number of people that are trying to harm him all while solving a murder. This film stemmed from Johnson’s obsession with classic detective stories, especially Dashiell Hammett. This film was a brilliant example of film noir. Dark and gritty, the film was well written and though it was somewhat complicated, the plot wasn’t difficult to follow. What I loved about this film was the fact that it was a hard boiled detective story but most of the characters are High Schoolers. Joseph Gordon Levitt is perfect as the loner detective, putting everything he has into the case even at the expense of his own health. While he is connected with other groups in the school, it is obvious that Brendan keeps to himself. A conversation with the school’s principal further solidifies Brendan as a private detective character. It becomes clear that Brendan has, reluctantly, helped the principal solve a case. The dynamic is such that Brendan is a private detective that helps the police, the school administration when they need it but is not a member of the police force. The film is a true hard-boiled detective noir film, from the vocabulary to the characters to the story that was brilliantly adapted to a High School setting with High School characters. It is my opinion that Rian Johnson has a great career in front of him. I thought Looper was brilliant and now, after seeing Brick, understand the man’s true talent. With a great script and a great director, Joseph Gordon Levitt is perfectly cast. Now, if you don’t like film noir this might not be the movie for you. For film noir fans, like me, I give this film a 9 out of 10 and highly recommend it.